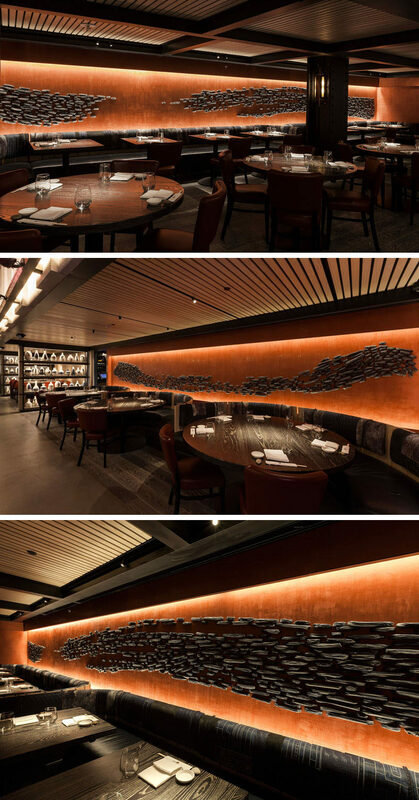 Interior architect and design firm Rockwell Group, have recently completed the design of the new Nobu Downtown restaurant in New York City, and as part of the interior design, they commissioned Canadian ceramic artist Pascale Girardin to create three art installations that would create a unique look for the restaurant. The first installation, a collaboration between the Rockwell Group and Pascale Girardin, is located in the main seating area of the restaurant and is made up of ceramic pieces that resemble briquettes of charred wood, organized to look like the positive and negative space from the stroke of a large brush. All 3,500 elements that make up the mural were crafted in Montreal, Canada and transported to New York, where they were attached to the red Venetian plaster wall one-by-one. The second installation, also a piece that was a collaboration between the Rockwell Group and Pascale Girardin, is located in the private dining area. This time the art installation is a section of wall inspired by Japanese boro textiles. The two and three dimensional mural is made up of glazed blocks and squares that provides the interior with a highly-textured effect, while adding shades of cobalt blue and concealing LED light fixtures that highlight the art. 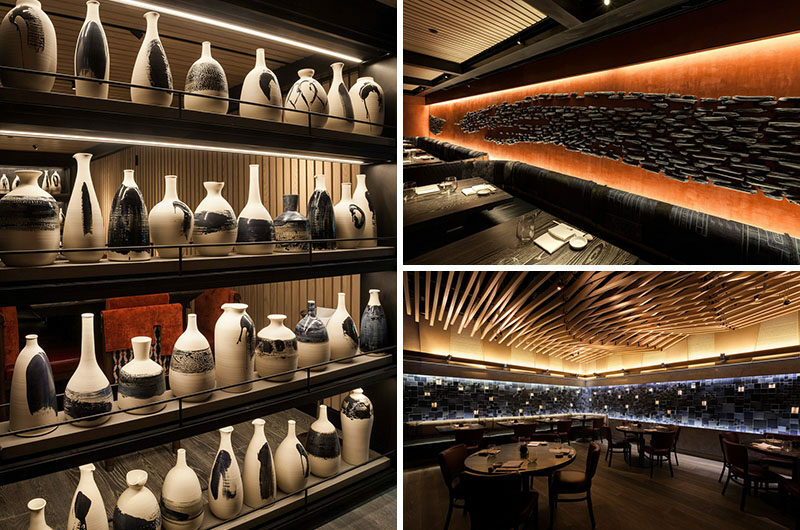 The last installation is in the private Sake Room, where Pascale Girardin crafted a collection of more than 70 earthenware rice-wine (sake) bottles that fill two floor-to-ceiling open shelves. The natural clay wheel-thrown vessels were created in honor of the Seto and Mino pottery-making traditions of south-central Japan. Each vessel was finished individually with unique blue cobalt brushstrokes, and the interiors are glazed making them fully functional.